Set your little learner up for writing success with year two writing worksheets! Our worksheets are created by teaching professionals and designed to give your child the skills practise and inspiration necessary to take them far. Let their creativity flow with countless writing prompts and sentence starters, and you just may come to find you’ve helped nurture the next great literary master of our time! 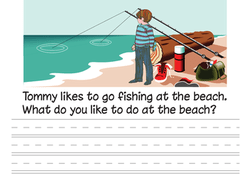 Give your child practise with his writing skills with this printable worksheet that asks your child to describe what he likes to do at the beach. Help your child improve his writing skills with this printable worksheet that asks him to describe what he likes to do at school. Once students have completed their first draft of opinion writing, guide students through a peer review conference with this checklist! Give this delectable worksheet to your 1st grader to practise opinion writing! Your child will love talking about his favorite ice cream. Use this open-ended writing activity to assess your students’ abilities to write informational texts and include appropriate text features. Use this activity to assess your first graders’ abilities to write procedural texts. Students are prompted to write step-by-step instructions for how to do or make something of their choosing. This worksheet helps first graders practices both punctuation and the use of high frequency words.